In 1932 Elmer operated a small radio shop on 23rd Avenue in Oakland, California. He doesn't say where, but 23rd Avenue is only about a mile and a half long and is near the Alameda Island Naval Base (now Coast Guard) where he was stationed in 1918. 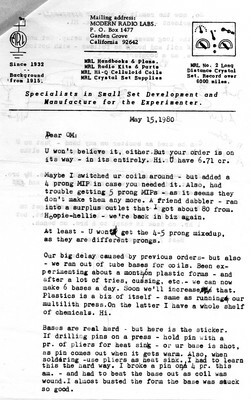 Back to 1932, he was in the shop experimenting with short wave coils when he ran out of coil forms. He rigged up some celluloid coil forms on tube bases. They worked so well he made more of them, and apparently sold them out of the shop. H. W. Dickow, the editor of "Radio" magazine, introduced Elmer to two factory sales reps from New York and Chicago. They each covered 7 states. Soon, Elmer was making coils all day and half the night - with no profit. He decided to sell them himself. 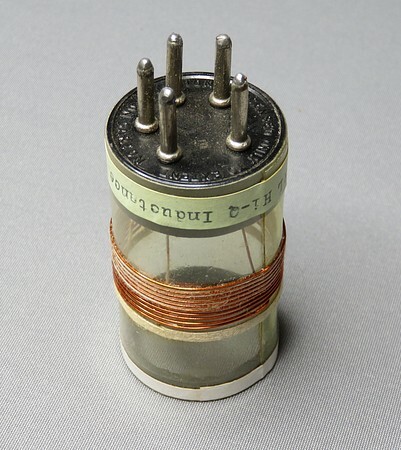 These coils are probably the reason he started Modern Radio Laboratories. 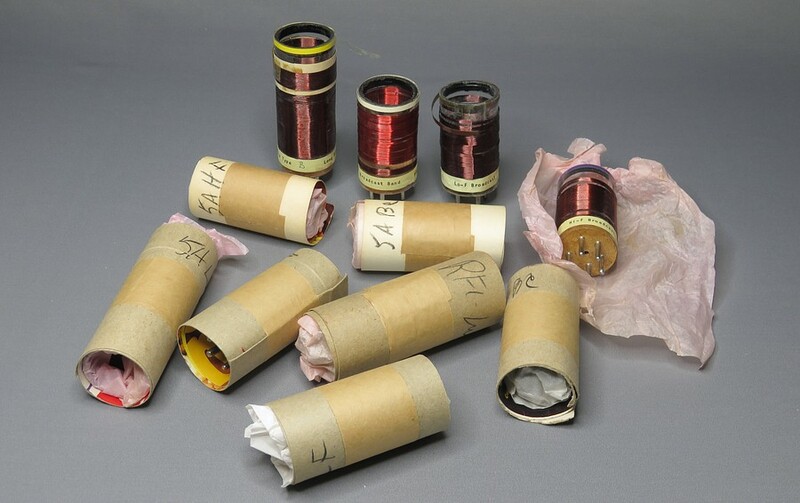 Elmer sold 45 different plug-in coils. Designated A, B, C, E, 5A, 5C, 5X, RF and TRF. 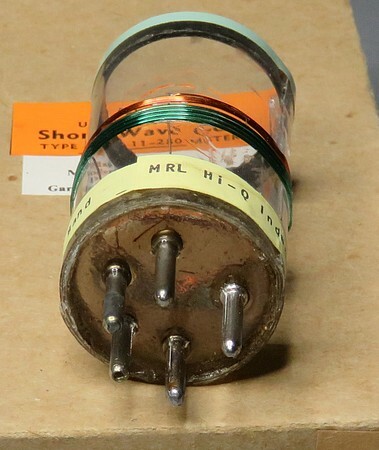 Shortwave coils came in a set of four. 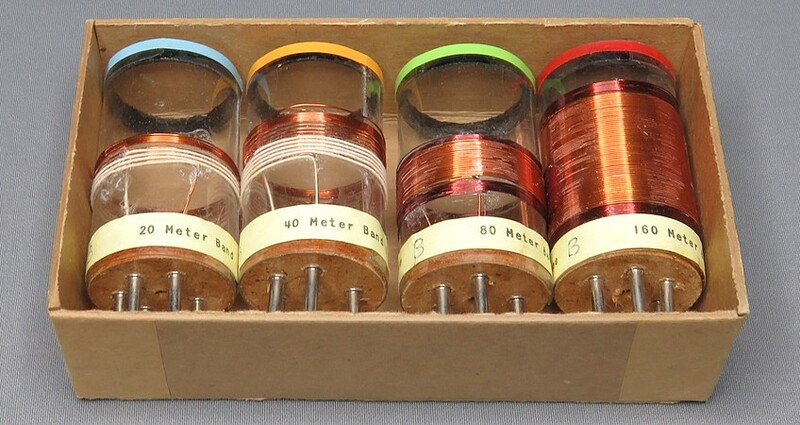 You had to buy a whole set of shortwave coils, but coils that weren't for the short wave bands were sold separately. 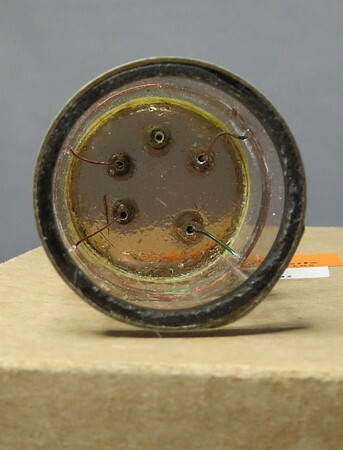 The last person to touch this coil was probably Mabel Osterhoudt, after Elmer made it. I did not defile it by touching it myself. 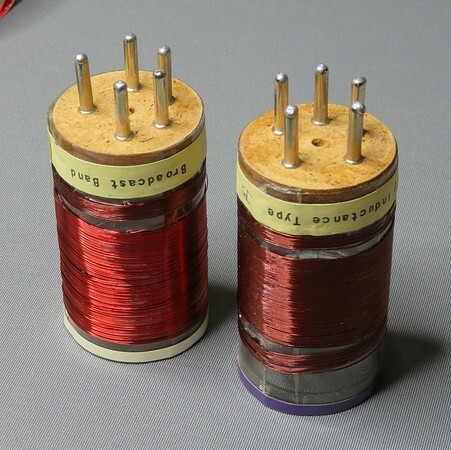 On the left is a very early coil with a commercially made base. 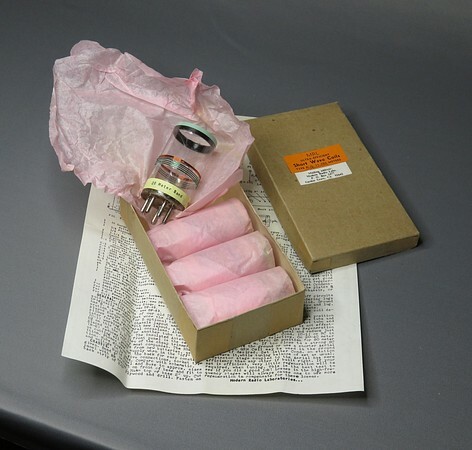 The label has been printed on a typewriter. 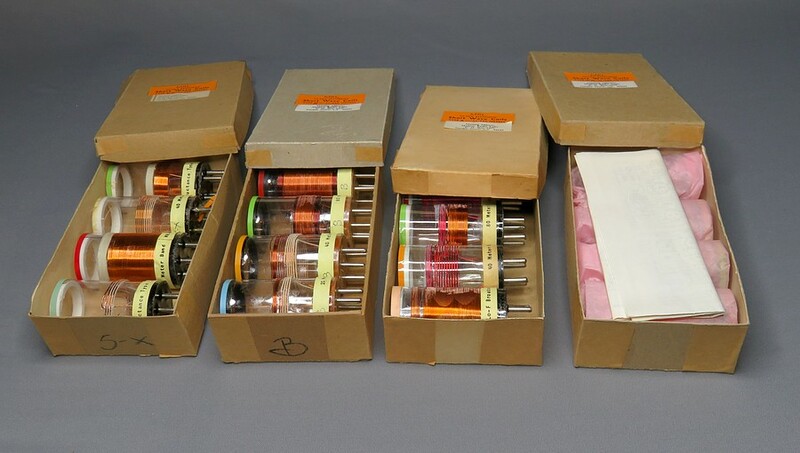 When the bases became unavailable, Elmer made his own, shown on the right. This material is another mysterious "Compo." that Elmer used. He stated the bases were not MIP, but I don't know what MIP means. 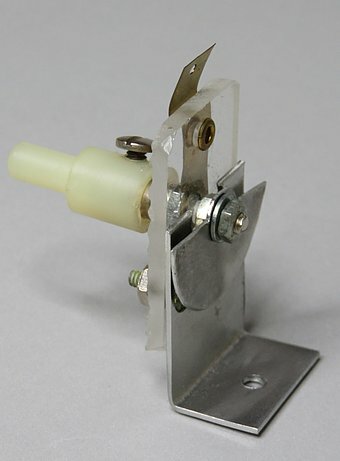 Mounted In Plastic, maybe. The hole in the center shows he used a hole saw to cut this out. Normally, when you're cutting a hole you're interested in the hole. Elmer was interested in what came out of the hole. Imagine you are making these yourself. You've purchased the pins, celluloid sheets and wire. You've cut out the bases and drilled holes for the pins. You've glued in the pins. 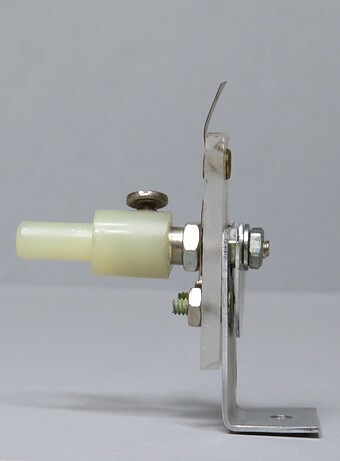 You make the forms, wind the coils (two or three separate coils on each form), solder the wires to the pins, paint it with coil cement, color code it, print a label and glue the label on the coil. How much would you charge for one of these? 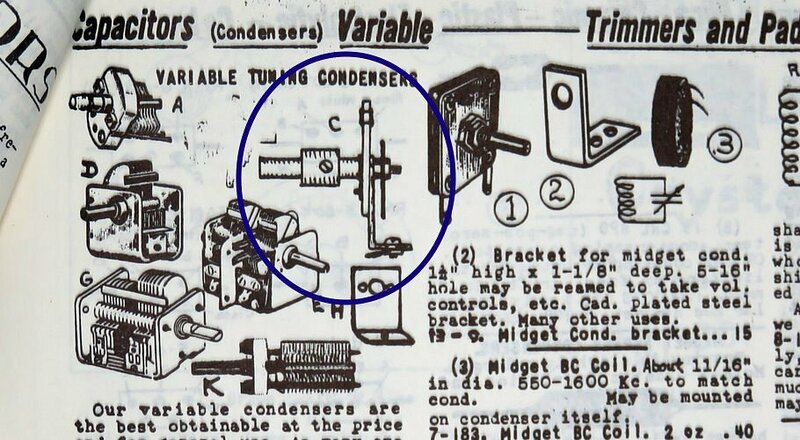 In 1979 Elmer charged $1.25 for a coil; $5 for a boxed set. Don't forget, you've got to make the box. If you bought a set you got the hand-made box for free. 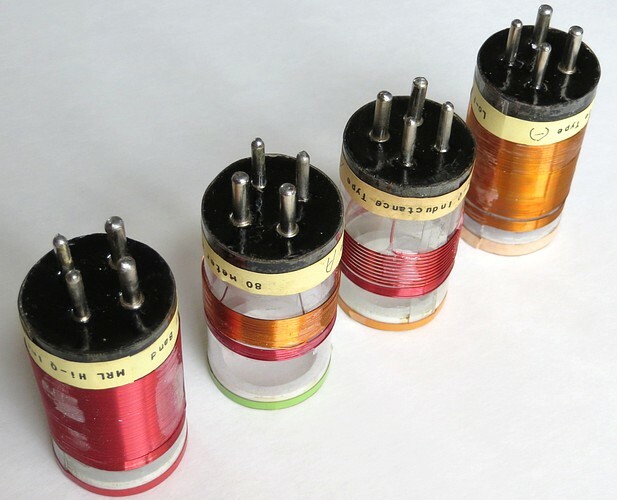 An early set of 5 pin coils. Elmer says he's been experimenting with plastics for a month and can now make 6 coil bases a day. 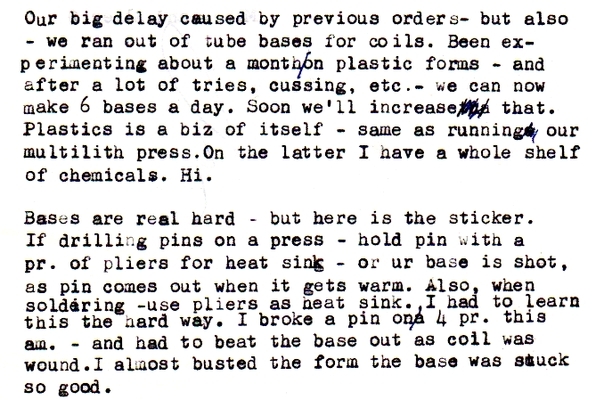 He also found the pins come out of the base if they get too hot. 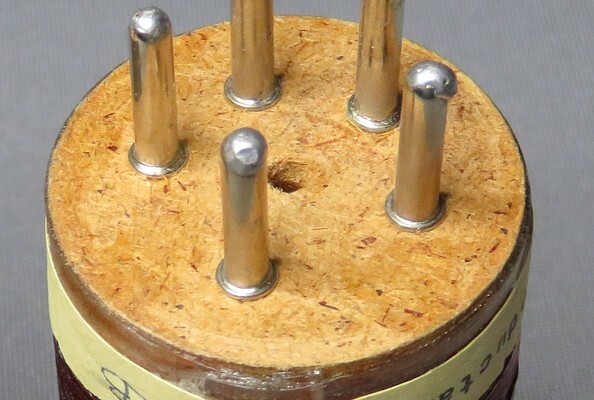 The mystery of the bent pins on some of Elmer's coils has just been solved! Is this an insight into Elmer's personality? Who says, "Hoopie-hellie?" See the entire letter here. 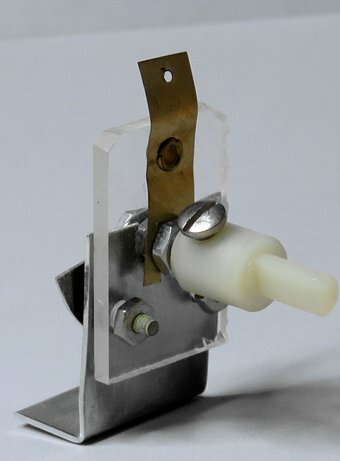 The plastic Elmer developed was transparent. By 1986 the plastic was black. How many formulations did he make? Did he ever tire of this? He was 87 years old. 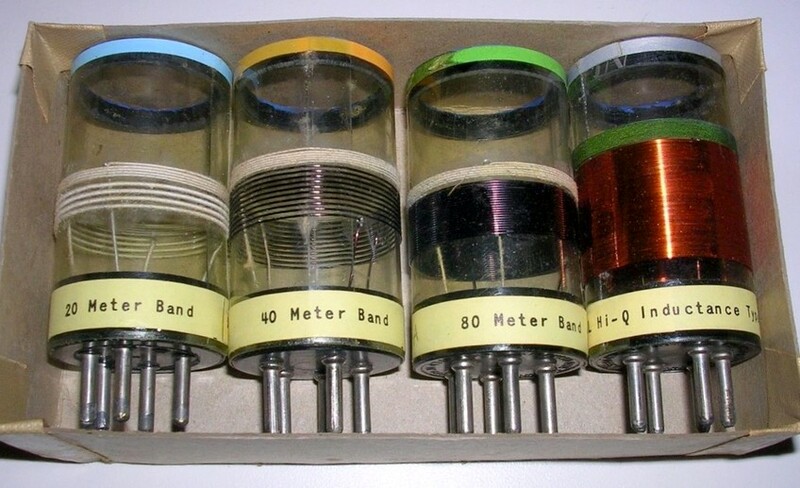 This set of black bottomed shortwave coils was purchased in 1986 to go with the MRL 1-TUBE DX ALL WAVE RECEIVER KIT. Advertisement in "Radio" magazine, September, 1934. This address is a residence 10 miles from the 1932 shop in Oakland, CA. 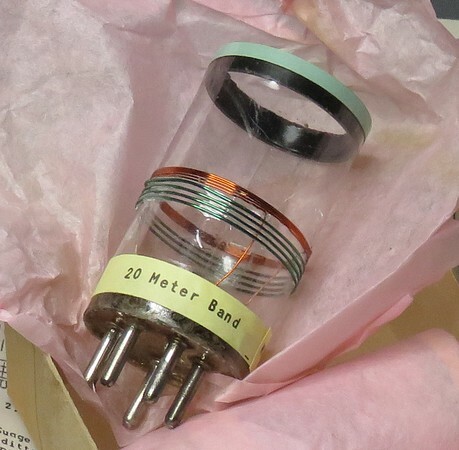 In the MRL catalog, among the 3D perspective drawings of variable capacitors, is Elmer's 2D drawing. 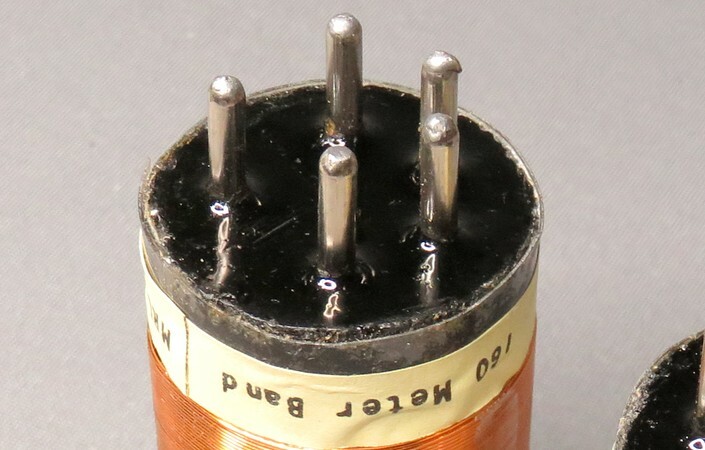 The actual capacitor. In 1986 this was $2. This appears again on the next page. 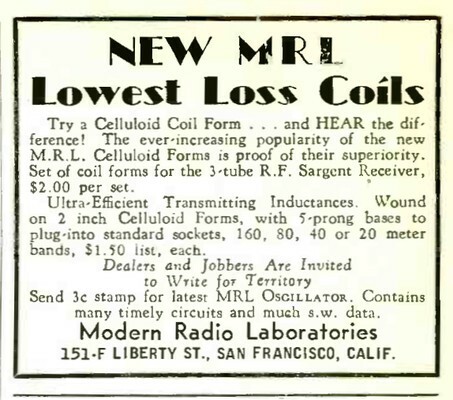 Another 1934 ad from "Radio" magazine for "MRL OSCILLATOR." It's "Full of Bargains." Is this the genesis of the MRL catalog? NOTE: The word "dope" used here is slang for "information."